Most dads think of Father’s Day one-dimensionally. We tend to look forward to kicking back, enjoying a few guilt-free hours watching the US Open on television. A Father’s Day gift guide might include a nice card or two, a needless tie, and maybe a day-off when it comes to active parenting, policing the drama that goes on around the house. But the foundational idea of Father’s Day is that of celebrating the relationship, not catering to the dad. We are dads so that we can do dad things that mean something, and we have the best celebrations when stuff happens that draws us closer to our kids. With that in mind, consider setting the agenda for Father’s Day this year and actually putting some ideas out there that will help solidify what to get for father’s day. 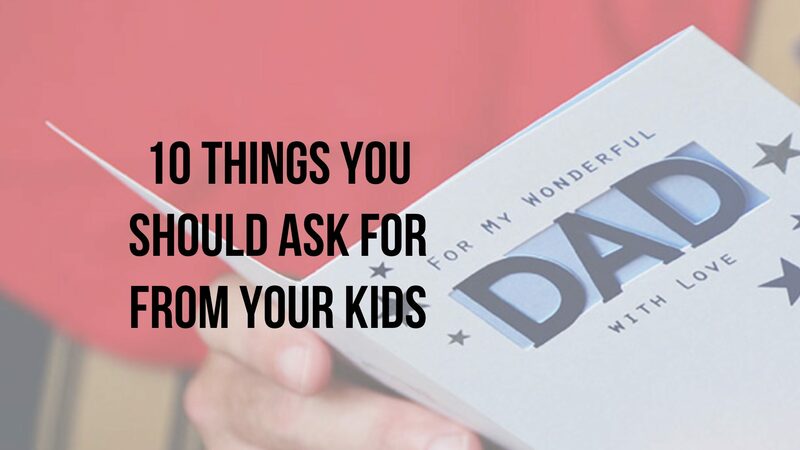 Here are some suggestions, the 10 things you should ask your kids for this Dad’s Day. If you’re a dad, you’ve already done the math. You know it’s going to be no time at all until they head off and live the rest of their lives. Do what it takes to grab some memories before they grab the car keys. It’s a fact that we can’t love what we don’t know. Make it clear to your kids that your love wants to know more than it wants to judge. It’s the love that heals, not the disapproval. Father knows best? How’s that working for you? How about asking for “Kids (might) know best?” Trust them enough to let them in to your open-ends and loose-strings. You’ll be surprised how much they already know. Get the kids writing and sharing stories and remembering good “Dad moments.” These are golden, and good for both dad and the kids. It doesn’t matter how old the children are, hugging dad should never go out of style. Be proactive on this one. Ask if you have to, but get it done. Ask the kids to share their vision with you. This is a little different from advice, it’s “big picture” stuff. Ask your kids things like, “How would you solve world hunger?” Ask them what they think about big ideas such as space travel, world peace, and racism. Then listen. Ask your children to think about a Father’s Day gift that won’t disappear in a day or two. Or ask them (for example) for one hour every Sunday afternoon for the next three months so you can pick their brain. Ask them for the commitment to walk a mile with you three times a week. You can even ask them to read you their favorite comic strip every day for a month. Ask for gifts that don’t end the moment they leave their hands. We all need a little redemption. How about coming clean with your kids and asking for a fresh start? Maybe you’ve been harsh… Or maybe they’ve been consistently disrespectful… Maybe you’ve lost ground…Whatever is going on, try to model humility and see where the relationship goes. Prepare a list of ten “I’m too old, I don’t get this!” questions and have a Q&A session with your kid(s). Maybe they can respond with a list of their own. Who knows, you may end up communicating! You may have to help pay for this one. But dinner out, one-on-one with each child, can be the most fun and the most productive parenting experience.